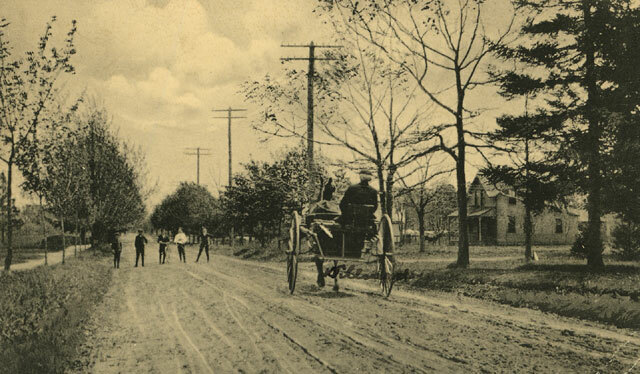 While the Lands lived longer in Hauppauge (Smithtown) Law and Percy both lived for some period of time in Central Islip. 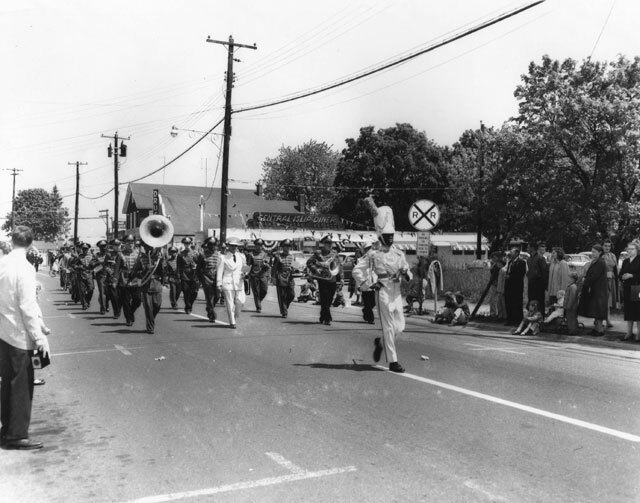 The closest shopping area and the train station to where the Lands lived in Hauppauge were in Central Islip. Law Land owned property in "Islip". 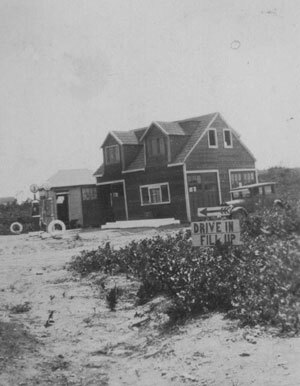 Percy Land build or rebuilt at least one building in Central Islip. This map of Central Islip shows Hauppauge Road indicated by the red arrow, Wheeler Road by the green arrow, Carlton Avenue by the blue arrow and Suffolk Avenue by the orange arrow. The current Long Island Express way runs approximately along the line of the dark grey arrow. 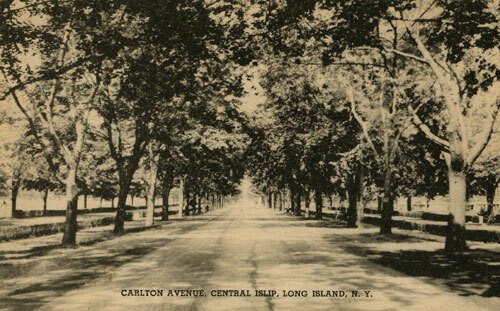 The main shopping area and the state Hospital were on Charlton Avenue. 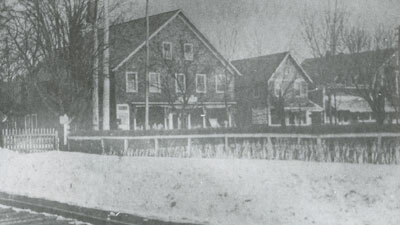 The train station marked by "Y" was at the intersection of Suffolk Avenue and Wheeler Road. Bud Land always told me when we drove through the area that the home of Law and Elizabeth Land is approximately where the "X" is. However, I now believe that he was mistaken. I cannot connect that property in any way with the Lands. 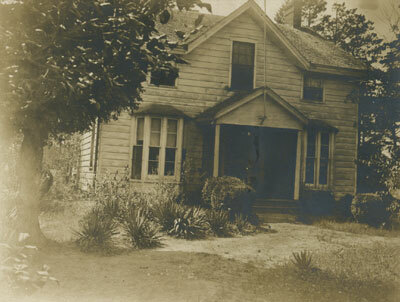 This is approximately where Percy and Meta were living in 1910. This is the property bought by Lydia Law Land in 1899 which she in turn sold to Law in 1901. 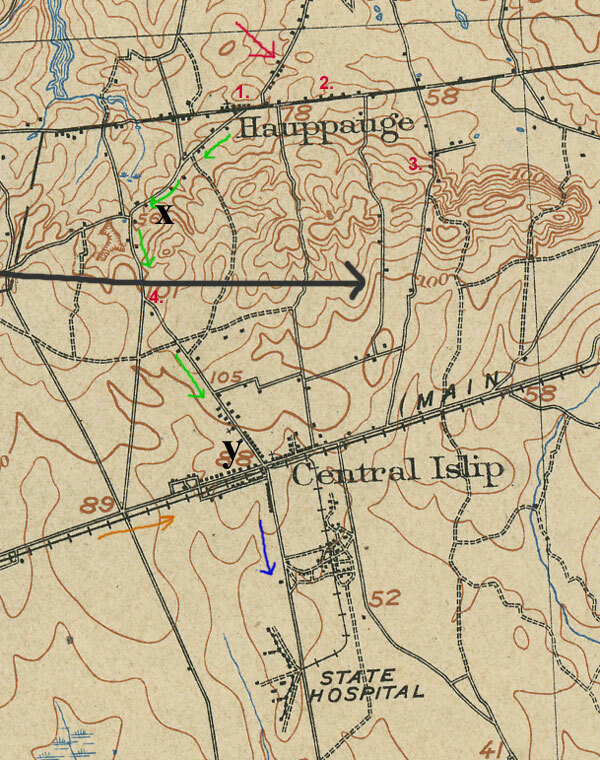 Clarence was living at this location for a while as a 1906/07 map of the area shows Mrs. C Land. This is a property of 25 acres that Law bought in 1903 and where he and Elizabeth and the younger children were listed in 1910. This is approximatley where Percy and Meta were listed in 1920. Percy has bought a piece of property very near #2 in 1919. 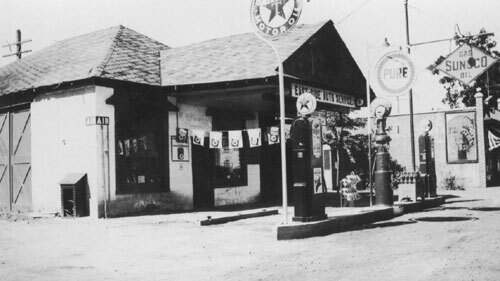 However, he bought the property on North Country Road in 1920 and it would appear that if the family lived at the property near #2 it was only for a short period of time. Numbers 3 and 4 are located in Central Islip. 1 and 2 are in Hauppauge. 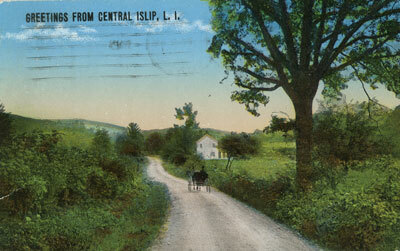 The train reached Central Islip in 1857. 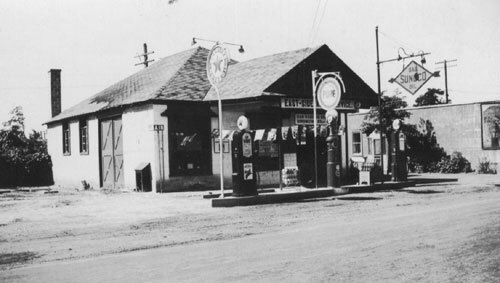 The Central Islip Station, called Suffolk Station, was located near where Islip Avenue crosses the railroad track. It was the terminus for the Long Island Railroad line until 1873. 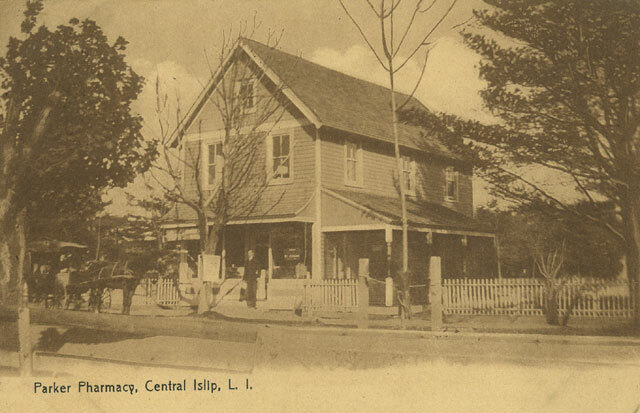 In 1873 the station was abandoned and a new station called Central Islip opened at Wheeler Road and Suffolk Ave. 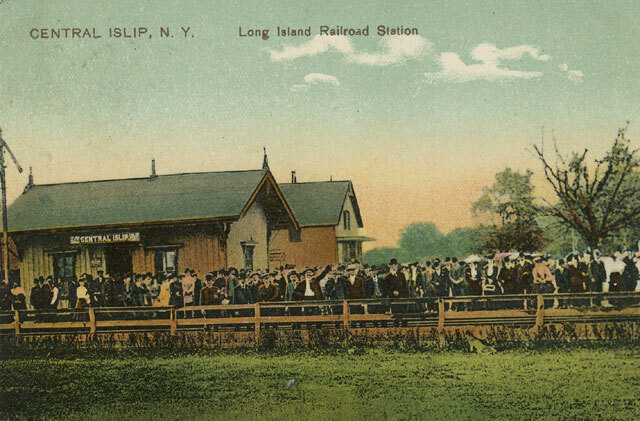 This was the closest train station to where the Lands first lived on Long Island. It is certainly the station from which they caught the train from Long Island to Hoboken. Sr. Anne Frances Pulling who grew up in Central Islip and has written two books on Central Islip wrote in November 2008 to say that she thought this picture was probably one of two events: "the day in 1910, when the first train came through from Penn Station or it could be one of the first hospital crowds of visitors." Church of the Mesiah, Suffolk Avenue, posted in 1907. Also identified in Around Central Islip as the Episcoplal church. "The Episcopal Church was built on the corner of Church Street and Suffolk Avenue. 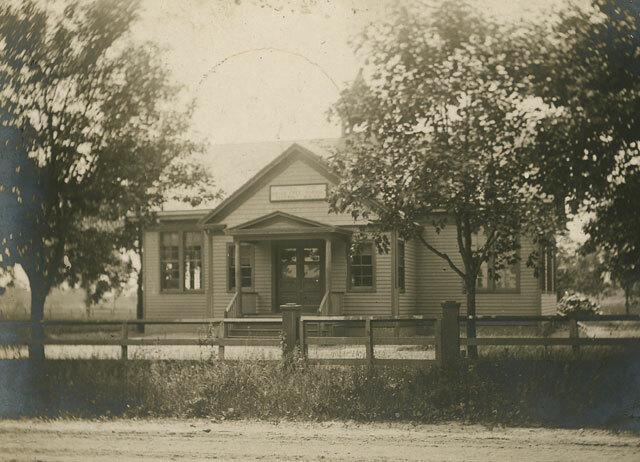 It was moved in 1923 to the corner of Suffolk and Brightside because the village was shifting to that location. A photo of its Church Street site is in my book. My father was a witness to the move." 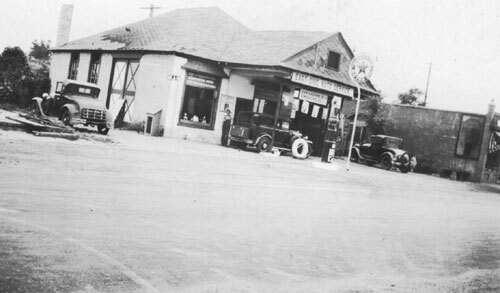 Sr. Anne Frances Pulling in Around Central Islip identifies these buildings as Morris Benstock's grocery and hardware store on the corner "just south of the railroad" which was demolished by fire in 1918 and rebuilt. The building next to it is identified as the pharmacy belong to Harrison Jones. See the picture of the "Parker Pharmacy" above. 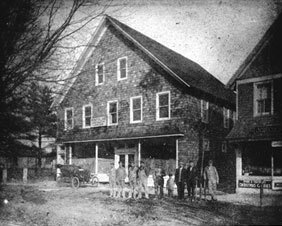 The widow arrangement clearly indicates that Benstock's was the building with Percy Land's sign over the porch. According to Helen Land this is a picture of the new Donaldson's store with Percy and his crew in front. The sign over he porch reads "PERCY A LAND CONTRACTOR AND BUILDER. 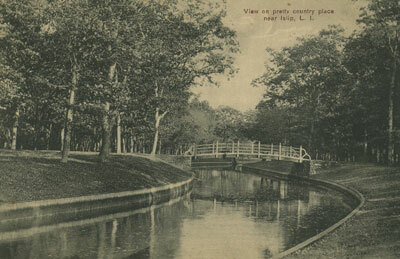 This is NOT a postcard, but a photograph that was among the collection of Helen Land. I believe that Helen was not correct in the identificaton of this building. 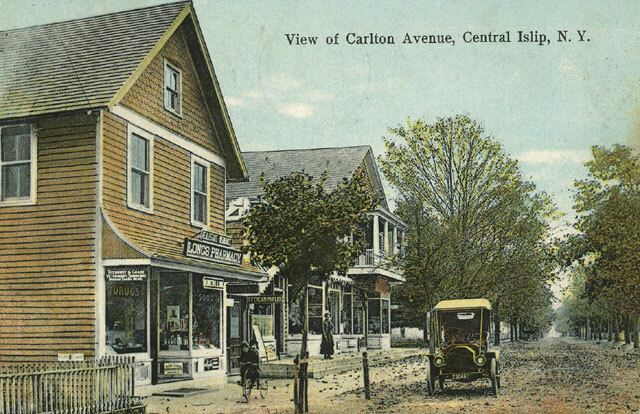 This is not the same building that the Smithtown Historical Society identifies as the second Donaldson's store. 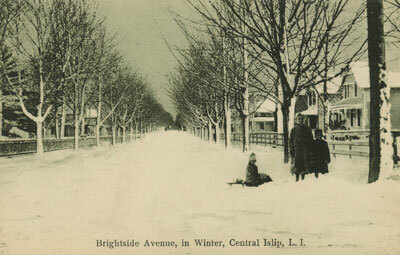 Brightside Avenue, in Winter, Central Islip L. I. 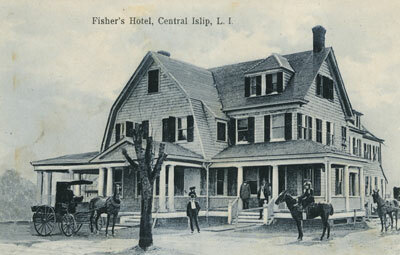 A Winter Scene, Central Islip L. I.
Fisher's Hotel, Central Islip, L. I. Can't read post mark. 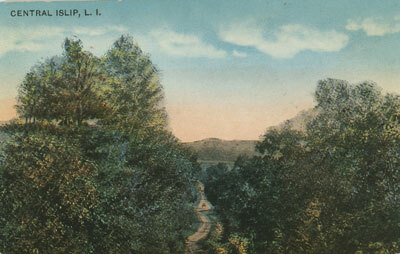 Evelyn Green sent this card to Lily Mott, Front St., Hempstead saying, "This is the picture of my aunt's house where I am staying in Central Islip"
Robbin's Hall, Central Islip State Hospital, Central Islip L. I.
Robbin's build in 1930 hall contained a theater, bowling ally and commissary. 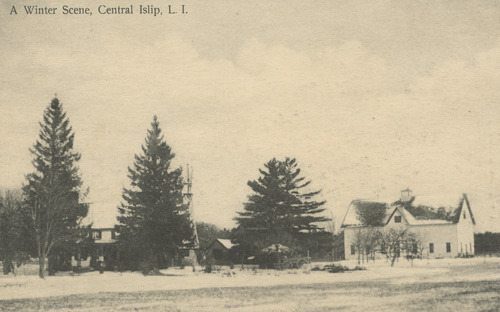 Patients Cottage Group F, Central Islip State Hospital, Central Islip L. I. 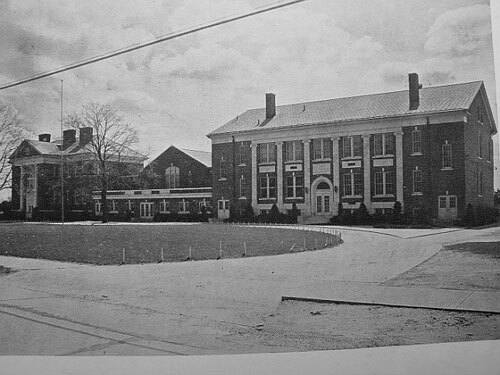 Started in 1889 for patients from the New York City asylums, Central Islip Hospital was a work farm. Patients cleared the land and planted trees and flower gardens. 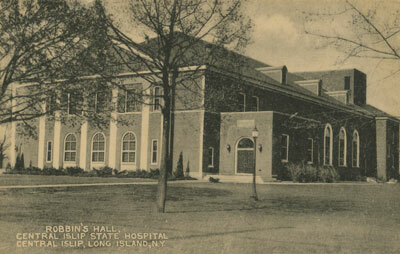 The outdoor work was considered good therapy and the Central Islip Hospital was a successful experiment to alleviate the overcrowding of the city hospitals. 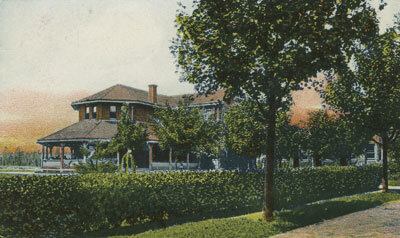 In addition to the psychiatric wards TB wards were added in 1903. The prescription for healing was "occupation, oxygen, rest, and recreation" and out door activities were a vital part of the therapy. The hospital was continually enlarged and surely there was carpentry work to be done. There was, in fact, a carpenter shop, which turned out furniture, which was used throughout the buildings. The patient population in 1911 was 4,154. I found your site whilst browsing Central Islip. 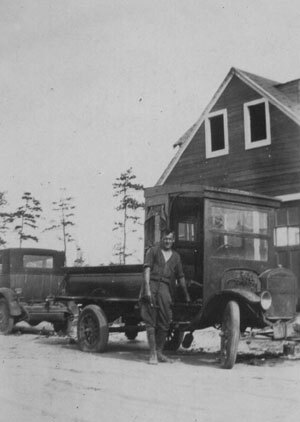 My Grandfather, Charles McCall, a motor engineer from Glasgow emmigrated to Central Islip early in 1930. 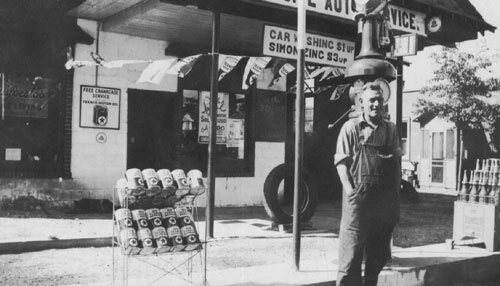 At the age of 44 he started up "East Side Auto Services" on Suffolk Avenue and was there at least until 1938. At that point in time my father stopped receiving his usual letters. Do you know of any local society that might be able to help in tracing what became of him or, even some elderly local who might remember buying fuel with their parents? Any information would be gratefully received. I have attached some photos of his garage which you can use on your site if you so wish." 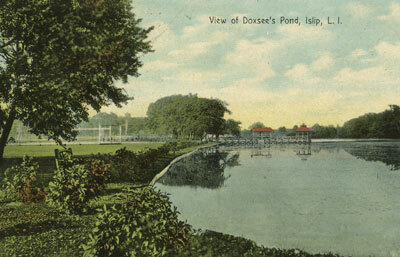 View of Doxsee's Pond, Islip, L. I. View on pretty county place near Islip, L. I.